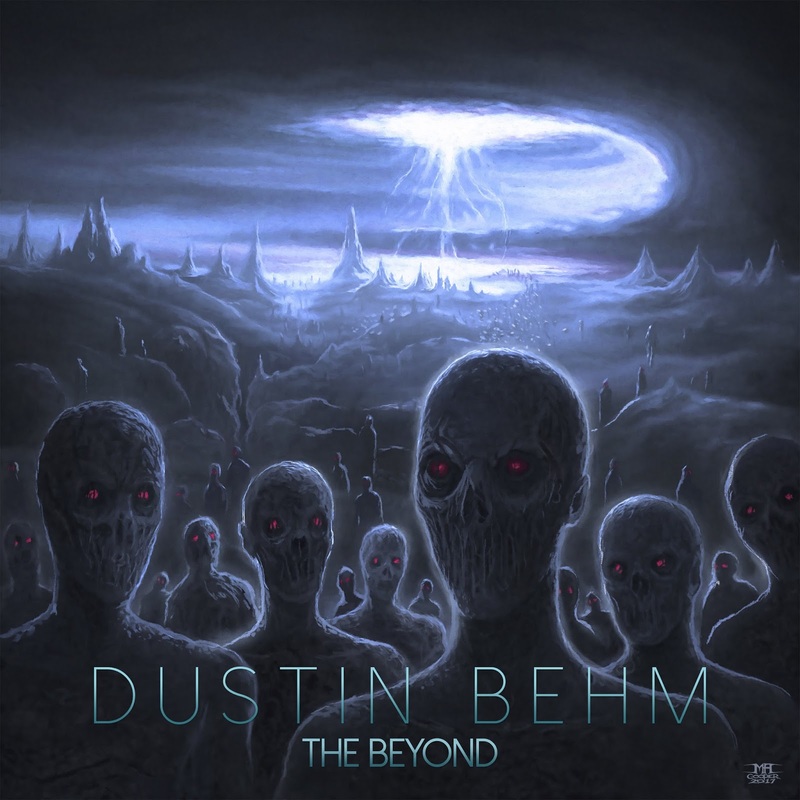 Progressive metal guitarist Dustin Behm released his solo debut album "The Beyond" across Europe sometime ago with an North American release set for this year! With that being a successor on his part, Dustin Behm himself goes into discussion about this album, his time as a musician, and what he has in-store. 1. What personal advice would you give to someone wanting to pursue this career? This is more business than artistic, but I think this advice can apply to any genre. Make sure this is something you love and will stick with because it takes long hours of practice and discipline to pursue a career in music. A key piece of advice is to use multiple avenues to create a living through music. Playing live with an original band or in a cover band, selling recordings physically or digitally, teaching lessons, doing transcriptions etc. Combining multiple sources of income to make a living is essential. Another important piece of advice is each job you can do is something you won't have to pay someone else to do for you. Learn as many jobs involved in the creation of your content as possible. I've always identified as a guitarist, but I've also had to play the role of producer, guitar tech, bassist, videographer, recording engineer, and graphic artist simply because I couldn't afford to pay someone to do those jobs for me (or was hired to do a job other than play guitar). Any skills you can develop related to your chosen field will ultimately aid you in the end, even if it's just having a better understanding of what service the person you're paying is providing. Another thing is to listen to lots of music and take note of what you like and what you might want to pursue in your own sound. Develop the ears of a listener and fan to get an idea of what the audience will expect. 2. When and why did you start playing? It all started with piano lessons in second grade, about 7 or 8 years old. My parents both played music and were wanting to expose me to it from a young age. I kept with it because I enjoyed it. I played for a couple years until my piano teacher stopped offering lessons, then took up trumpet in the school band. Summer after 6th grade I got braces on my teeth and my trumpet career was over. I began playing guitar at age 13 because I had gotten into classic rock music and Japanese rock and thought the guitar was a lot cooler than the trumpet. I mostly listened to electric guitar music at the time. 3. Which instruments other than the guitar, would you say that you play? I can play bass and dabble in synths and keyboards. I play drums at a very elementary level. I definitely prefer the guitar as I've had far more practice time than any other instrument and it feels much more comfortable. A very important instrument (if you could call it that) is the DAW and sequencer that I use for the drum parts and some of the synth lines on my album. Learning to record and accurately capture your instrument can be nearly as important as skill on the instrument itself. 4. What were the first tune(s) you learned? First tunes... hmmm it's been a while. From what I can remember it was a lot of classic rock like Purple Haze, Stairway to Heaven, Tush, Iron Man, that kind of thing. Then I started learning some Thrash metal like Ride The Lightning and Into The Pit. In High School I learned to play Cliffs of Dover and I was very proud of that. Went to music school shortly after and Cliffs of Dover seemed like a distant memory after that, haha. 5. Would you say that your family is musical? 6. Can you describe your family member's musical interests and abilities? Both parents play the guitar and my Dad plays drums. He was always jamming in Blues and Rock bands when I was a kid. My grandfather played trombone in the jazz big band era and had some success with it. My family's interest was always a big motivator in my love for music of all kinds. 7. Which famous musicians have you learned from and also admire? I got to learn from some really incredible teachers during my time at Musicians Institute in Los Angeles. Paul Gilbert and Scott Henderson are probably the best known. It was always incredible hearing those guys at clinics and open counseling sessions.My personal teacher was a great guitarist named Greg Harrison or Gregzilla. That dude blew my mind in terms of what was possible on the guitar. Another amazing experience was attending the open counseling of tapping master TJ Helmerich. Jamming with TJ in an all tapping improvised session is one of my favorite music school memories. Allan Holdsworth and Shawn Lane are my favorite guitar players. I got to attend a clinic and Q/A session with Allan and it's still some of the most incredible playing I've ever seen live. Though I never got to see or meet Shawn, I often listen to his music and find his style and emotion very enriching. I could go on all day about other guitarists I admire; I'm really a fanboy at heart. 8. Can you describe to me your first instrument and or other instruments you first played? Piano and trumpet were my first before guitar. I still think the piano is pretty cool and can appreciate skilled trumpet playing. 9. What are your fondest musical memories? In your house? In your neighborhood or town? I have many fond musical memories from over the years. I'll never forget my first metal concert seeing Chris Broderick at age 14, many amazing times at Musicians Institute, seeing many incredible musicians such as Scott Henderson, Greg Howe, Frank Gambale, Vital Information, Planet X, Allan Holdsworth, and others. Traveling to Italy and the UK to visit and collaborate with musician friends, teaching guitar lessons in Italy and playing shows with my band Increate are some other highlights. One memory that stands out in a huge way was seeing Motorhead and Morbid Angel at age 14. They were both outstanding and it's a bit of an odd combination. Seeing Morbid Angel that night really blew my mind, they had a huge light show and large fans blowing their hair around. It was a spectacle to see, but also super heavy and dark sounding in a way that I hadn't encountered yet. They were playing material from the album Gateways to Annihilation and it sounded huge. I was in the front row with no earplugs (I began wearing them at all concerts after) getting crushed by a thousand sweaty metal fans. It was intense and the 14 year old me loved every minute of it. That night was huge in my decision to start playing death metal. I'd never encountered music with that kind of power even though I'd been to a few rock/metal shows by that point. 10. Can you disclose to those who may not know, that "The Beyond" album is purely an instrumental album correct? So those hoping for vocals won't be disappointed when listening in ya know? Yes, The Beyond is purely instrumental. I like instrumental music because I think it creates a soundtrack for your imagination. When there are lyrics, in some way the listener is being told what to think about. With instrumental music it's purely up to the listener to create their own worlds inside their heads. A song can be about anything you want and anything you imagine it to be. I think you have to have a certain level of imagination and ear for melody/rhythm to appreciate instrumental music effectively so I can understand it's not for everyone. However, vocals can sometimes ruin great instrumentation if not executed properly. 11. "The Beyond" is your debut efforts in terms of solo work, how does this make you feel, you excited, scared, or could not care less about it, just hear it already! It's very exciting. The project began as something fun, mainly to practice my recording skills and work on some experimental music. After the first few songs were written and I got the production to a certain point, the idea of doing a solo album was intriguing as it was something I'd had the desire to do for a long time. When I had worked on solo material previously, the production quality and musicianship weren't there yet. This recording was different in that I had gotten new recording equipment, and technology had evolved. Toontrack products made this album possible; I can't say enough about the quality of their software. I had also improved as a guitarist after years of playing in live bands. In the past my answer would have been scared, because I always wanted my stuff to be the "best" (an impossible goal for many reasons) and I was a perfectionist. When nothing less than perfect will do, it guarantees a feeling of failure 100% of the time. This time I had no expectations that the album would go beyond a few friends and family, so it's very exciting that people are interested in listening to this material. It has far surpassed my original expectations of a simple demo tape. 12. Why should music listeners go forth and check out you Dustin Behm and listen to this album "The Beyond"? I think it offers something unique to the listener. My guitar playing is purposely unusual on this record. I had a rule that most of the licks had to be something I hadn't heard before. No old school blues licks that have been recycled a million times. There are some diminished and chromatic ideas that I've heard explored by others, but in general I was trying to make the guitar sound as alien as possible. This is also why I used an E-bow set to the harmonic setting for a couple sections, notably on Mechanization and The Beyond (an electronic bow that generates a magnetic field around the guitar string causing it to vibrate without actually touching the string). Some of it may be over the top or jarring to a conventional ear. I hope that those who appreciate experimental music and want a challenging yet rewarding listening experience will find it thoroughly gripping. Anyone who wants an aggressive soundtrack for working or gaming (first person shooters?) should enjoy it due to the energy and aggression. There is also a lot of variety in terms of genre. 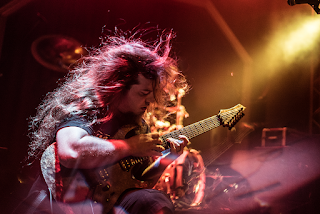 It's mostly fairly punishing metal, but sub-genres are also represented, such as thrash, djent, tech death, progressive metal which I attempt to meld cohesively. I hope that someone who likes thrash metal finds something to enjoy just as much as someone who likes progressive metal or technical death metal. 13. What are the plans in-store for this year that just opened up? Initially there are some promotional activities for The Beyond, and this year I'm also writing new material with my band Increate and playing live around the Northwest USA. I'm continuing to improve my studio and work on new musical techniques (always exploring to further evolve my original sound). I'm also planning a new project this year with some even more intense musical ideas than those on The Beyond. 14. If you had to do it all over again, would you still choose this career? Would you do anything differently? That's a good question. It has it's ups and downs, but I've been lucky to have some level of success. I would still choose this career because I feel it is what I was meant to do. Nothing else has excited me they way that guitar and music have. I feel a strong connection to it that I'm grateful for. It's a special career for those few who can manage to make it work, but can be challenging since you probably won't have healthcare or other benefits that people who work "regular" jobs enjoy. The benefit is more to the soul and can be worth suffering a loss of other benefits in order to do something fulfilling. If I could do anything differently, I would have practiced more and started with a metronome earlier. 15. How do you get people to take you seriously as a musician? By putting in a lot of practice time! Eventually all that practice hones an ability that's well beyond average and creates an original sound; the ability to play something that people have never heard before. You can play a great cover of a classic song and get noticed, but I think once you develop your own sound as a musician that's when people begin to take you more seriously. My teachers at MI always said the best thing you can do is develop your own sound or style to the point where when people hear it they instantly know it's you. Think of any well-respected musician and chances are you know their sound instantly when their music is played (assuming you're familiar with the artist). Originality and skill are major qualities for a respected musician. Another thing that helps a lot (especially in the age of YouTube and social media) is to be respectful of your peers and take other musicians seriously if you want to be taken seriously. Encourage players that you like and give helpful advice to those still learning. No one is going to respect a musician who trolls on his peers and talks down to other musicians to boost their own ego. Someone who is an upstanding member of the guitar/music community and is respectful will be taken much more seriously than the insecure troll who needs to insult others to feel better about a mediocre playing level.